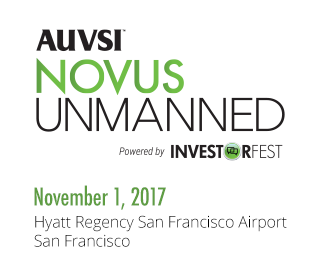 AUVSI Novus Unmanned, powered by the Venture Acceleration Program of Investorfest, will bring together premier innovators and investors from the world of autonomous and unmanned technology and systems. The Association for the Unmanned Vehicles International (AUVSI) is the world's largest nonprofit organization devoted exclusively to advancing the unmanned systems and robotics community. Serving more than 7,500 members from government organizations, industry and academia, AUVSI has a 45-year history of fostering, developing, and promoting unmanned systems and robotics technologies. Investorfest is a venture accelerator with a 10+ year history of working with investment-attractive high-tech startups, making them investment-ready. Investorfest has earned the trust and confidence of not only startups but also some of the most highly regarded investors* in high tech—Accel, Benchmark, Cisco Ventures, Intel Capital, Khosla Ventures, Kleiner Perkins Caufield & Byers, Mayfield, Shasta Ventures … to name a few. * Investorfest’s network of 600+ investors include those who are on Forbes The Midas List 2017. Copyright © 2017 AUVSI. All rights reserved.